It’s difficult to find accurate national statistics regarding the number of Americans victimized by precious metal cons. However, in 2014 the U.S. Senate Special Committee on Aging reported that more than 10,000 Americans had been victimized in precious metals scams, to the tune of roughly $300 million. The number is probably higher based on the fact that many victims may not yet realize the deception, whether it’s a truly bogus product or simply a misrepresentation, both can be devastating. Reports of precious metal scams were lower overall in 2014 and 2015 when prices were falling, because fraud activity is directly affected by demand. Stalling global economies, Brexit and a general mistrust of floundering quantitative easing programs are just some of the symptoms causing greater economic consternation than usual. It’s important to realize that investors have found comfort in the ownership of physical precious metals throughout history, fueled by the enduring benefits of universal acceptance, appreciation during market downturns and most importantly today, value integrity maintenance, while other currencies and investment vehicles dwindle or disintegrate. Our governments are not being honest with their citizens, because the truth could cause panic. Instead, they just keep pounding away with the same insipid programs, supporting an illusion of activity, in otherwise catatonic economies. So it makes more sense than ever before, to stock up on physical precious metals, by all means available. The best way to identify a reputable and trustworthy precious metals dealer is by researching their reputation and years in business. 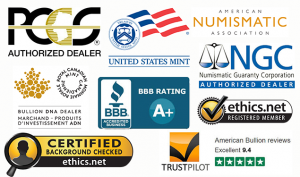 Check for good standing memberships in industry watchdog associations like the Numismatic Guaranty Corporation, Professional Coin Grading Service, Industry Council for Tangible Assets, American Numismatic Association and the Better Business Bureau. You can also research through consumer feedback firms like Google Plus, Business Consumer Alliance, Yelp and Trust Link Reviews. Trust Pilot reviews are extremely helpful, because in order to provide a review, you are required to first be a customer. The principals of American Bullion, Inc. each had many years of commodities experience, prior to creating the company in 2009. Their mission from the onset was to pioneer the Gold IRA industry, making it a tax-free and hassle-free event. They are members in good standing with all the organizations listed above and have an envious 5-Star rating with Trust Pilot, based exclusively on customer opinion. American Bullion operates a professional, trustworthy and transparent service. Whether you’re looking for physical delivery, or to rollover a qualified 401k, 403b, or any other qualified plan, call the experts at American Bullion at (800) 465-3472.